This nice spate river rises above Hobseat at MR 716863 and flows to the sea some fifteen miles downstream at Stonehaven at MR 877863. It is the largest and most important of our three local streams and (with the exception of a private one mile beat at Rickarton House) is leased by the club throughout its length. 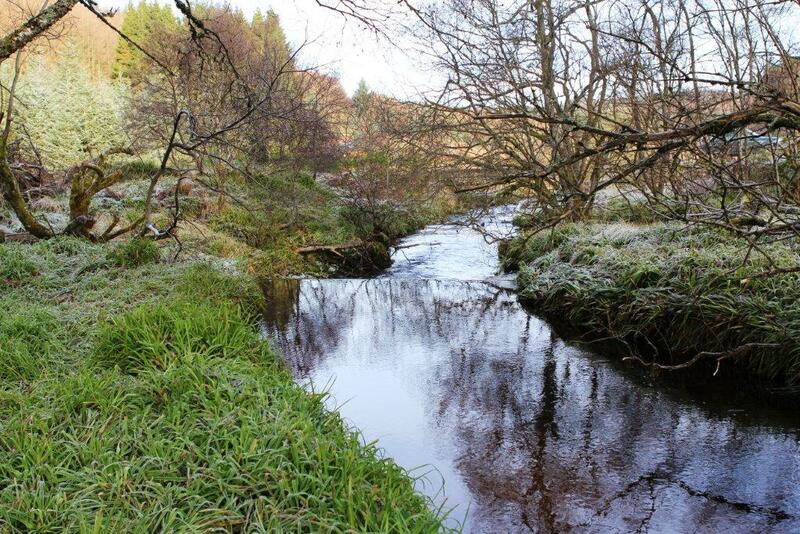 It enjoys good runs of salmon and seatrout (both being classed at law as 'salmon') and has some brown trout. It is tended by three conveners. A club map of the Cowie and its pools is available to members for the mere sum off £3.00. We have the salmon fishing rights on both banks from the river's source at Mid Hill at MR 716863 (the site of a forthcoming wind farm) downstream through Hobseat and Swanley to the march with the private Rickarton House beat, where the left (north) bank boundary is located at MR 834879, whilst the right (south) bank limit is some 250 yards further downstream at MR 835883. Both boundaries are clearly signposted. 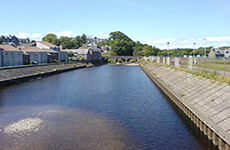 Pictured to the right is the new fish pass at the intake pool that was installed in summer of 2013. 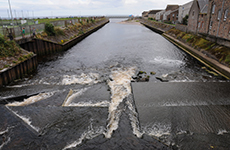 A fish counter was installed within the fish pass during late 2018 and commissioned in March 2019. This beat occupies the next mile or so of river, from the twin staggered signposts downstream to the Inkbottle Bridge. Under no circumstances are SDAA members permitted to fish on this particular stretch. Middle and Lower Cowie : under the Rickarton Estate lease, we also enjoy the salmon rights on both banks from the Inkbottle Bridge on the Slug Road at MR 843884 (where a lockfast SDAA car park is situated), downstream through Ury Estate and various fishing pools including the Intake Pool (see homepage) and the semi-tidal Estuary Pool - a favoured nocturnal seatrout location - and thus to the sea at Stonehaven. This is the more productive Cowie stretch, although it must be said that the upper beat is definitely fished less! Experienced River Cowie fly fishers who are prepared to put in long hours at night and are unfazed by the thumps and bumps of the nocturnal riverbank, can winkle out some nice seatrout to fly or alternatively the often deadly fly-and-maggot. Catch-and-release is a widely practised conservation tool on our fishings. The SDAA is particularly diligent in defending its members' interests from any developments which threaten the fish stocks and the natural habitat, and this tends to include virtually all prospective housing developments on flood plains and anywhere else intimately adjacent to the waterside. During the nineties, the club was instrumental in the buyout of the former Bridge of Cowie salmon netting station at Stonehaven Bay by the Atlantic Salmon Conservation Trust (Scotland), for whom we act as Mandatory after providing two-thirds of that capital. As a result of this purchase, SDAA members now enjoy the exclusive right to fish for salmon and seatrout along the whole foreshore there from the Open Air Pool to the Harbour breakwater, and may do so with rod and line by all lawful means - effectively spinning and fly fishing. This is quite definitely an under-rated and as yet under-used angling facility, although its popularity is certainly growing.